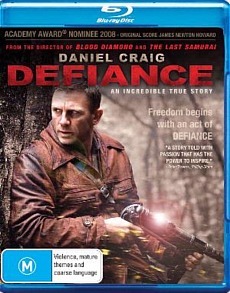 Defiance Blu-ray Review. Defiance opens in 1941 with the Nazi invasion of Eastern Europe, and tells of wave of terror and murder perpetrated by Hitler’s SS and the efforts of a small band of Jewish partisans to resist their bloodthirsty occupiers in any way possible. Defiance opens in 1941 with the Nazi invasion of Eastern Europe, and tells of wave of terror and murder perpetrated by Hitler’s SS and the efforts of a small band of Jewish partisans to resist their bloodthirsty occupiers in any way possible. The film stars Daniel Craig, fresh from his success in Casino Royale and presumably already rehearsing his Oscar acceptance speech in his head (Jewish + Nazis = Academy Award), and is directed by Edward Zwick of Blood Diamond and Last Samurai fame. Sadly however the results were somewhat uneven, much like Craig’s Belarusian accent, and plaudits evaded the usually reliable Zwick this time around. Defiance received a middling critical and commercial reception, barely managing to recoup its $50 million budget. It also garnered controversy for its rather one-sided depiction of the Bielski partisans whose own crimes against the local populace are wholly ignored, the lack of Belarusian language, several glaring inaccuracies and also for what some reviewers took for a stance implying the majority of Jews living in Nazi-occupied Europe made little or no effort to oppose their German oppressors, unlike the coarsely noble partisans depicted herein. The film also contains a number of trumped-up battle sequences which are wholly invented and reportedly shocked Nechama Tec, upon whose book the movie is based, by portraying the mostly reticent partisans as a crack squad of combat-hungry hill-dwelling commandos. On a more positive note the film does attempt to deal with its weighty subject matter in a meaningful way and its intentions are undoubtedly positive - all criticisms aside, it does succeed fairly ably at drawing attention to a heretofore little known resistance movement on the Eastern Front. There are a number of strong performances, including that of Australian Mia Wasikowska (Alice in Wonderland) as Craig’s love interest. Ultimately however the film’s pacing is rather leaden and its Good Guys vs. Bad Guys shtick both skirts the whole truth and never really holds the viewer’s attention in the way it was intended. For a colour feature this one came across as wilfully black and white, and not merely in the period footage.